How does a corporate entity counter negative publicity about a major infrastructure project that’s going viral? One axiom of social media is that a company cannot control public opinion. So, how does it manage sentiment on a large scale? Not long ago, one Indian infrastructure major was facing a backlash of public opinion about a multi-billion-dollar project down under. The backlash was fast going viral and could affect the very survival of the project. In addition, the group was being hurt by negative corporate news from India. Social media listening gave useful insights that this group leveraged. Using these insights, the group built a positive narrative that was so widely shared that it overshadowed the negative sentiment. Infrastructure biggies have largely ignored social media. Even LinkedIn is used without an appreciation of its role in brand building. We studied 4 Indian infrastructure majors – let’s call them Indian1, Indian2, Indian3 and Indian4. As a reference point, we added the biggest US name in infrastructure development – let’s call this …. American1. We wanted to measure the strength of opinion – positive, negative and neutral – about our peer group of 5 majors. This we measured by the number of shares that their updates received on social media over a period of 6 months. Digging deeper, we classified the updates in terms of the topics they dealt with, finally arriving at 3 classes – updates relating to corporate and financial news, updates on general developments relating to the group’s activities and updates relating to the group’s projects. 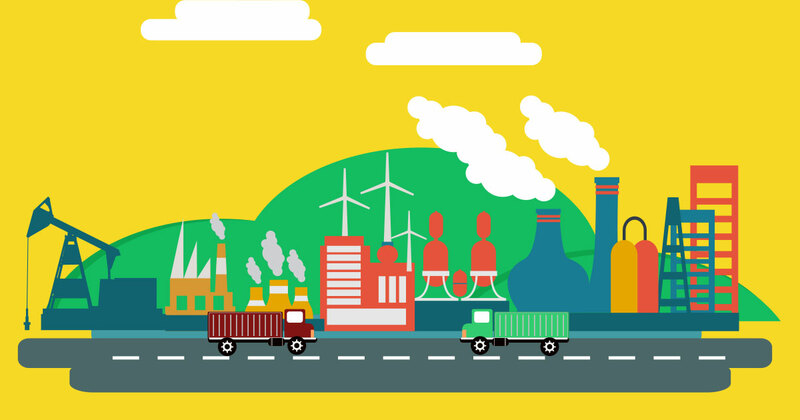 Modern infrastructure projects are typically carried out on a grand scale and often involve technological innovations and social transformation. Quite naturally, images of these grand projects attract great interest, reflected by the number of times their stories get shared on social media. Indian1 – a diversified conglomerate with a strong global brand equity – was clearly setting the pace with 3.7 lakh followers on LinkedIn alone. 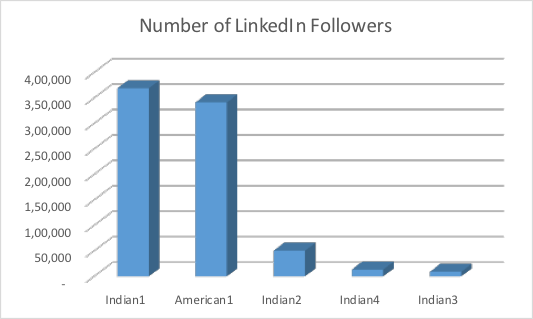 In fact, Indian1 had more followers on LinkedIn than American1, which had around 3.4 lakhs. Eyeballing the LinkedIn posts from our 5 infra majors gave us the clue – Indian1 was strategically leveraging visual content. Their website likewise was a visual treat. 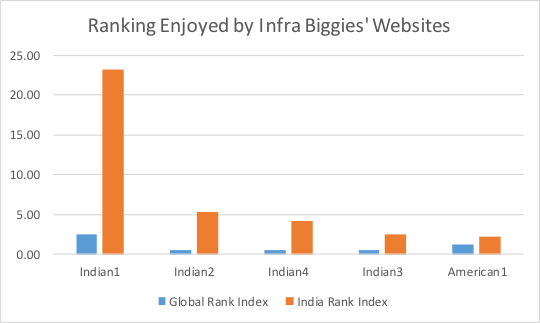 No wonder then, that its website was ranked far and above the highest – higher ranked even globally than American1’s website. We analysed the headlines of these updates. They gave us the clue about the sentiment of the stories that were being shared. A constant stream of such image-rich posts yielded positive brand perceptions – not only for Indian1 and American1, but as we shall see, for the group facing the string negative backlash – namely Indian4. Indian4 faced a huge surge of negative sentiment arising from one of its mining projects down under, which could potentially damage an iconic natural formation off the coastline. The group turned to Facebook – a rarity among infrastructure majors – because that’s where the maximum momentum of public opinion could be generated. What’s more, its presence on Facebook was consistently left unchallenged by its competitors. The group leveraged spectacular project imagery, as well as content relating to a National Geographic TV programme. The results were equally spectacular. It gained a countervailing positive sentiment that completely overshadowed the negative in terms of shares on Facebook. The negative news kept coming in – the company could do little to stem that tide. But the 2.2 lakh shares of negative stories on Facebook was overwhelmed by the 3.0 lakh shares of positive stories due to this strategy. 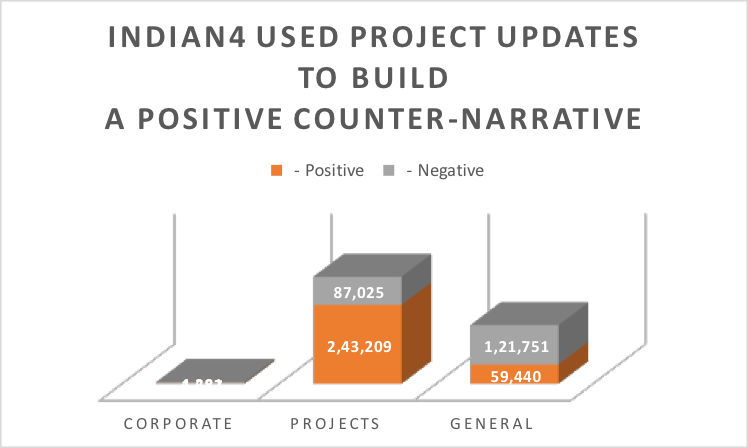 Indian4 had successfully shifted the brand perception battle-ground, focusing its posts on its grand projects with their abundant photo ops. Social media listening – for a company in the context of its competitors and peers – can give useful insights as to which brand narratives are striking a chord with the public. These insights give marketers useful guidelines for brand building – both to tackle temporary challenges as well as to build the brand in the long run.